This Haftorah really speaks to me, reminding me to believe and visualize the goals of my journey in order to make it happen. You too can make all good things happen through your focused emunah in the things for which you hope. Let us together visualize the Final Temple and rebuild it with Emunah! In this week's haftorah, the prophet Yechezkiel describes a vision of the third Holy Temple and its altar. This parallels this week's Torah portion which inclues the dedication of the Tabernacle's altar. Yechezkiel's vision of the Final Third Temple took place shortly after the destruction of the First Temple, in the midst of the Babylonian exile. HaShem tells Yechezkiel that by describing the vision of the Beit Hamikdash to the Jewish people, they would hopefully become ashamed of the wrongdoings that caused the destruction of the Temple. "You, Son of man, describe the House to the House of Israel, that they may be ashamed of their iniquities; let them measure its plan (Yechezkiel 43:10). This week's haftorah opens with a magnificent vision of the Third Beit Hamikdash, focussing on the altar from where we receive atonement. "If they are embarrassed of all that they have done, then show them the form of the Beit Hamikdash, its specific rooms, exits and entrances... and write this before them and they should retain its entire image and all its specifications and they will construct them." (Ibid 11). Radak explains that Hashem revealed to Israel in exile, that we have the opportunity to erect the third and final Beit Hamikdash, if we repent and contemplate our final redemption. Even during the darkness of exile, by feeling ashamed of our wrongdoing, we can merit to see a glimpse of Hashem's glorious Home in the perfected world. The verse in Hebrew literally writes, "If they are embarrassed of all that they have done the form of the Home at its fashion..." only at the end of the sentence does it mention "Let them know." This led me to think that the connection between our embarrassment of wrongdoing/repentance and receiving a vision of the Beit Hamikdash goes both ways. Not only is receiving the vision dependent on our teshuvah, our teshuvah is also dependent on receiving a vision of the Beit Hamikdash! Quantum physics verify that viewing an object has an effect on the behavior of the object. In the Torah, we know that the two witnesses who witness the new moon determine the exact day of the beginning of the new month. Their seeing the moon affects and changes the reality of time. However, what we look at also has an effect on us. For this reason, for example, it is forbidden to stare at the face of a wicked person (Magen Avraham, Ohr Hachaim 225, 20). Chassidut emphasizes that what we look at has an affect on the person who looks. Therefore, looking at a vision of the perfected abode for Hashem's Divine Presence can have a tremendous positive effect on us, to align us with the Divine will. Perhaps this is why the entire continuation of the haftorah and the last many sections of the Book of Shemot, describe the Mishkan (Tabernacle) and the Temple in such vivid details, so that we should visualize the holy Temple and repent. As part of the messianic era that we live in, we are fortunate to have many great opportunities to visualize the final Temple. Machon Beit Hamikdash in the Old City has reconstructed most of the vessels, including the magnificent Golden Menorah. 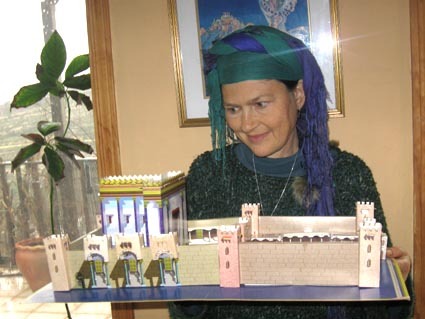 We have the model of the Beit Hamikdash in the Bayit Va'Gan and various virtual Beit Hamikdash's, as well as an assortment of "build the Holy Temple" model kits. The one you see in the photo with me is a kit created by my neighbour Mordecai Kohen in Bat Ayin. It look my son, then age eleven, a whole summer vacation to build it. The revelation of the Temple is an unbelievable comfort during exile. When we feel lost in exile and view ourselves as rejected by Hashem, He reveals us His boundless love by showing us a glimpse of eternity, and reminds us not to despair, but rather focus on the holy. Hashem invites us to rise above our personal difficulties, through steadfast emunah in the forthcoming redemption. Our sincere faith in the rebuilding of the Temple gives us the opportunity to be part of eternity. Even at the time of the destruction of the Temple, the golden Keruvim (Cherubs) on top of the lid of the Holy Ark were embracing one another, signifying Hashem’s endless love for Israel and His desire to return His Presence to our midst. As a little girl in Denmark, I remember always turning to an Invisible Comforter when lying in my bed, crying to Him and feeling His comfort and love. Visualize the Miniature Temple of Women’s Holistic Torah Learning on the Land! The power of visualization is incredible. Imagining the great things we hope for in our life and really believing that they will happen cause them to materialize. Here at Midreshet B’erot Bat Ayin we are working on building our miniature Temple, our holy permanent building which will house, Torah learning for Women in the Judean Hills of Israel. It will have two classrooms and a large Beit Midrash with our Torah library. If Holistic Torah learning for Women in the Land is important to you, please take a look at the floor-plan of our first building. Try to visualize and believe that it will be built very soon. Send your personal prayers for the success of my North America Tour, to bring home the additional funds needed to make this building a reality this year! We at Midreshet B’erot Bat Ayin have steadfast emunah that our first building will begin very soon. Rabbi David Siegel based on Radak writes beautifully about the connection between visualizing the Temple and meriting it. Yechezkiel told Israel to focus on every detail of the future Beit Hamikdash and commit it to memory. Radak explains that Hashem gave the Jewish people, then in exile, the opportunity of constructing the third Beit Hamikdash through their emunah. He quotes the famous principle of Chazal, “Whoever believes in the advent of Mashiach will merit the redemption.” If we believe in the building of the Temple, concentrate on the details of its construction, and aspire to be present during the time of the final Beit Hamikdash, we will, G-d willing, merit it!